The Lusty Men and The True Story of Jesse James play as part of a 15-film Nicholas Ray retrospective at New York’s Film Forum on August 5th. 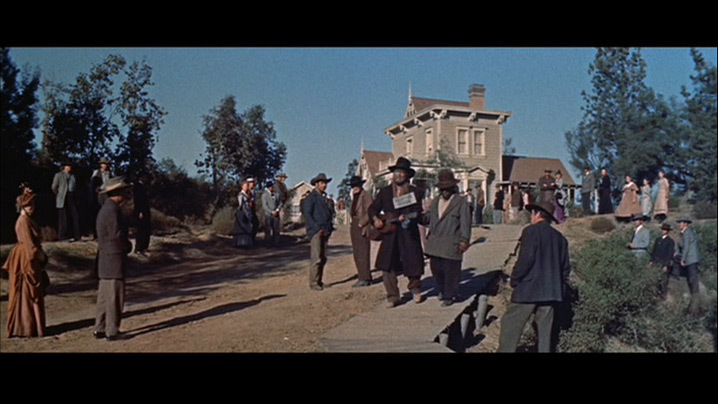 The West is an idea that is ripe for the kind of explorations Nicholas Ray is fond of making. When faced with the unknown, as in latter 19th-Century America, new communities begin to form, separate from the strictures of traditional society. 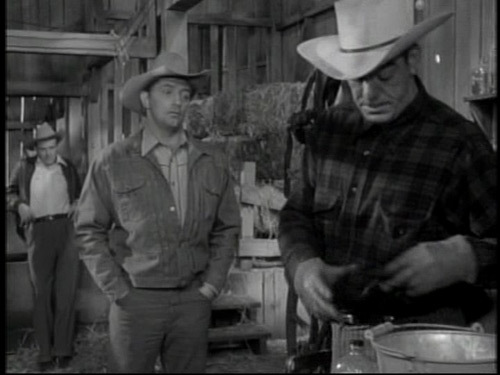 The Lusty Men (1952) is about rediscovering the emotional possibilities of the frontier, while The True Story of Jesse James (1957) attempts to define the mythology of that era’s first push forward. The Lusty Men could very well be named We Can’t Go Home Again. 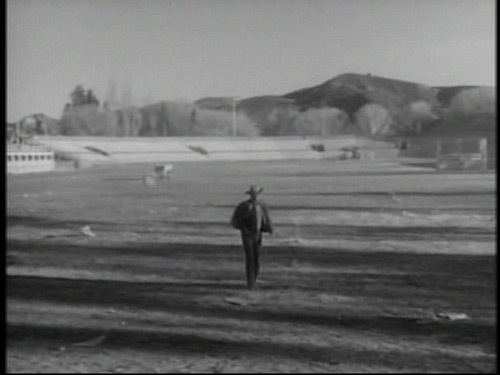 In what is likely Ray’s greatest opening sequence, a broken, limping rodeo tramp named Jeff McCloud (Robert Mitchum) walks across an empty, windswept field, silently. He eventually makes it to his childhood home, and rediscovers those emblems of his happier youth. The grin on his face movingly indicates all that he has lost, and all that he had hoped to be when young. 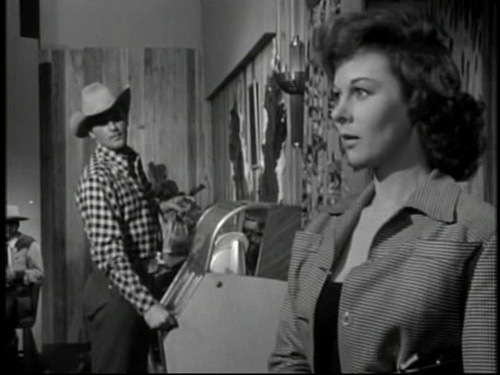 When Wes and Louise Merritt (Arthur Kennedy & Susan Hayward) enter his life, he is drawn away from beginning anew, and promises of a better life become lost again. 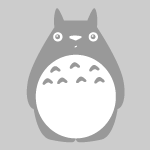 One of the primary desires of any Ray character is to form a family away from the pressures and dangers of the world. In The Lusty Men, unlike other Ray movies, a traditionally domestic life is what is desired. Ray’s ambivalence toward or rejection of society does not have a presence within the primary narratives of the film. The rise-and-fall narrative trajectory that engulfs both Jeff and Wes tends to feel too conventional at times. The poetry of The Lusty Men lies in the moments lurking in between the plot. Like Hot Blood, Wind Across the Everglades and The Savage Innocents, Ray plunges into the details of marginalized communities, examining them up close with a respect for the ability of those families to move beyond the realm of respectability. Ray brings his camera into real rodeo events, observing the exciting, chaotic dangers of being thrown from a violent bull. The visceral thrills of putting one’s life on the line are placed front and center. Ray’s engagement with deep space is at its most sophisticated. In both the world of domestic ranching and of the rodeo high life, either Jeff or Wes has experience and power. When one is in the other’s “home,” the other stands in the background, observing, controlling. Louise’s ambivalence toward rodeos further triangulates the balance of power. When she sees Wes collecting his prize money, her eyes unexpectedly widen with desire. And there is Jeff, watching from afar. 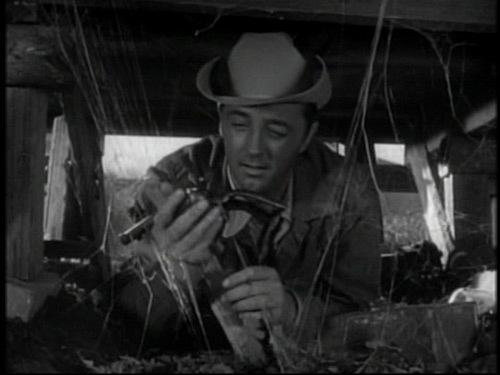 The weight of The Lusty Men comes from Mitchum’s performance, one of his greatest. The whisper of his voice and the hunch of his shoulders reflect all that he has lost in his life. Ray saves his aching close-ups for the moment of Jeff’s confession to Louise, her awareness of Jeff’s and her own feelings exploding through her eyes. All that Jeff needs to convey his heartbreak is a heavy sigh, a look away, and a shrug of the shoulders. His fate is sealed. Any ambivalence that can be read in the ending of The Lusty Men, in spite of its dubiously optimistic return to order from chaos, comes from the chance denied to Jeff and Louise. Wes Merritt may not quite be David Brand, but his salvation comes from the death of a man who denied his own happiness. The Lusty Men is one of Ray’s finest examinations of the lost dreams of the middle-aged, and the tenuous possibilities of regaining a part of those dreams. In truth, the majority of his work explored that particular demographic. His fame as a chronicler of youth is not unfounded, but in terms of quantity, young people only grabbed his attention every few years or so. The True Story of Jesse James moves in that realm, accompanied by They Live by Night, Knock on Any Door, and Rebel Without a Cause. 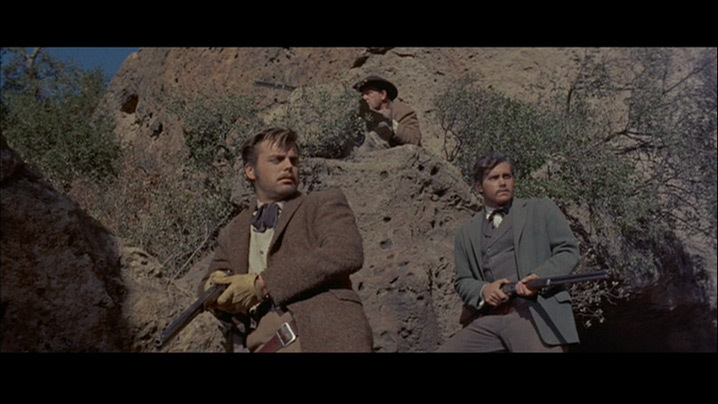 The film sets out to render the myth of Jesse and Frank James (Robert Wagner and Jeffrey Hunter) as lost boys being oppressed by external forces who dictate social development. The problem with Ray’s approach is his conflating of events and characters until the last 6 years of Jesse’s life turn into a couple of weeks. Furthermore, much of the film tends to simplify the image of James into a binary: noble folk hero, then fame-obsessed, bloodthirsty killer. Jesse’s transition is too schematic and sudden to be all that believable. None of the richness, eccentricity, and complicated behavior that marks the individuals populating Ray’s best work is to be found. All of this would feel much differently if Ray engaged the ’Scope frame to deliver his unique visual and aural tension, placing the characters as part of and working against their environments. Aside from the occasionally electrifying shot—a dolly of Jesse and Zee (Hope Lange) walking down the street, Frank peering into Zee’s soul and discovering her feelings about Jesse—space becomes flattened and static, something Ray seems allergic to in every other ’Scope film he made. No sense of the power of the image is present in Ray’s camera. As a final tableau hears the famous ballad honoring Jesse’s life, spurious hagiography smothers a story that should have been a radical revision of mythology. If Nicholas Ray saw the complexity and sadness behind the American Dream in The Lusty Men, he saw only black and white in The True Story of Jesse James. The story goes that James Dean was to play Jesse, and then he died. Ray also said that the film was to be structured like a folk ballad. Sadly, circumstances prevented either of these ideas from making it to the screen.